The Southern Walnut Creek Trail is Austin's first Urban Trail. The trail is open for public use and begins at Govalle Park and ends in the vicinity of Johnny Morris Road and Daffen Lane. The trail is approximately 7.3 miles in length and consists of a 10' wide concrete trail with 2' shoulders. There are several creek crossings and trail heads on the trail. Click here for hours and recreational information. Completed in early 2016, this trail spans from Mopac south to Walnut Creek Metropolitan Park. It has 9 creek crossings and 4 trail heads. Click here to view a map of the project. 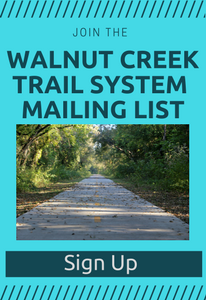 This project is a continuation of the Walnut Creek Trail Phase 1 project (5261.001). It will construct a 10' wide trail with 2' wide shoulders from Amherst Drive to the northern end point of the Phase 1 trail and the connection to the Mopac Trail currently being built by the Regional Turnpike Authority. Phase 1A has been broken up into two stages to speed up construction and reduce inconvenience to the neighborhood. The southern stage of the project includes the trail from Mopac to the south side of the baseball field in Balcones District Park. It will be included as part of the Waters Park Relief Main project, a utility project that will install a larger capacity wastewater system to help serve the growing developments upstream of Walnut Creek. The northern stage of Phase 1A (segments 3, 4, and 5) will build trail south of Scribe Drive between Amherst Drive and the south side of the baseball field in the Balcones District Park. Bids were opened on October 19, 2017 and the City is currently working with the apparent low bidder to execute the contract as soon as possible. The project should be ready to start construction soon after the new year and will take approximately 6 months to complete. Clay Harris, Project Manager, clay.harris@austintexas.gov or 512-974-7895. Funded for design and construction by the 2016 Bond, this project will design a new 1.8 mile long trail segment on the Walnut Creek Greenbelt. The trail will originate in Walnut Creek Metropolitan Park and end at IH-35 and Walnut Creek, and connect to the southern end of the Phase 1 project. Spring 2017 Information gathering sessions April 2017 public meetings. View the meeting presentation. View the meeting handout. Genest Landry, Project Manager, genest.landry@austintexas.gov or 512-974-8749. Funded by the 2016 Mobility Bond, this project will conduct a preliminary engineering report to evaluate an urban trail connection from Northern Walnut Creek Trail to Southern Walnut Creek Trail. No funding for design or construction is identified at this time. This map shows potential routes for each segment of the trail. Please note, the "abandoned alternative" route is no longer being considered as an option for construction. A public meeting was held in August 2018. View the presentation. Dario Octaviano, Project Manager, Dario.Octaviano@austintexas.gov, 512-974-7607.